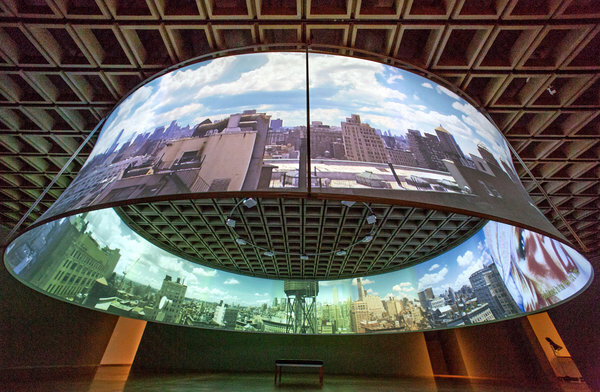 “In the Air” by conceptual film artist T.J. Wilcox, is a stunning panoramic film instillation at the Whitney that asks the viewer to consider the complex, entertaining relationship between New York and film. His new work makes you realize anew how perfect a match New York and film are for the other. I mean the pedestal upon which we have placed the shining city of New York (where dreams are made from) is largely constructed from famous movie moments. In a way, this piece is part narrative of New York, part exploration of the city’s reputation as cultivated by film, and part personal biography of Wilcox’s career in New York. Although Wilcox’s is best known for shorter projections,— films only a few minutes long (and often looped) that are pieced together from all kinds of existing footage— with “In the Air” he goes BIG, and the effect is astounding. This project began from his reaction to the 360-degree view from his own studio, he descrbes the moment as initial paralysis followed by compete awe of the city’s ageless majesty. Consistent with his preference for lower-tech gear, he downgraded his equipment from five complicated cameras to the same number of relatively small, rugged, inexpensive GoPros. He also found he improved resolution by switching from filming to shooting stills. And he prayed for sun skies, but dotted with clouds so the stills would have some interest. And after much trial and error and some uncooperative weather, in July Wilcox was finally able to shoot about 15 hours’ worth of a single day in the life of New York City. He ended up with 60,000 stills, shot at a rate of one per second. These were individually processed, and then animated and sped up using a computer program that seamlessly stitched the views together, eliminating distortions and evening light levels. The final result is pure majesty and clarity. The wraparound vista portrays a timeless living record of New York that is ethereal and yet absolutely personal. By omitting the details of street traffic and storefronts, the ageless and eternal grandeur of the city can be fully appreciated. The sights include the Con Edison clock tower, Zeckendorf Towers, Freedom Tower and the West Side, with glimpses of the Hudson and New Jersey. The sun pushes shadows from many sets of clouds in different shades and shapes across the masses of architecture; airplanes arrive and depart; the lights of the city come on and then dim, as the sun returns. But that is not all. Superimposed on the panorama are six short cameo-films that pull us from one place or era, one event or personality to another, across varying film methods, between color and black and white. The cameos appear one at a time on different parts of the screen, each with its own title, forming a carefully linked loop of narratives. Some draw on Wilcox’s life, like “On the Horizon” which remembers the prominent fashion illustrator Antonio Lopez by stringing together images of his work, film footage, stills of him and also of break dancers performing in his studio. The Con Edison tower in the backgrounds of some images of the break dancers are within sight of Mr. Lopez’s former studio just across the square. My own reaction to this piece is to consider how it portrays the singularity of New York, its diversity of people, and cultural resources, and yet concurrently represents a non-discrimatory haven for all. Even though the city is a shining beacon for lofty ambitions, it is still a place for all, and it’s spectacular reputation never imposes an ostentatious barrier to anyone seeking to make it their home. I can not take credit for the photograph; it came from his website or the museum’s. But I really thought his video instillation was beautiful as well. I wish I could see the work in person!